Shares of New Age Beverages (NASDAQ:NBEV) were moving higher last month after the CBD (cannabidiol) beverage maker got a boost from a passage of the pot-friendly farm bill and as it made an acquisition to improve its distribution, especially in Asia. As a result, the stock finished December up 12%, according to data from S&P Global Market Intelligence. As the chart below shows, it was another rough month for New Age, but the stock nonetheless finished with double-digit gains. New Age shares exploded in September, when the company announced a move into CBD beverages, jumping on to the cannabis bandwagon and transforming its proposition to investors. The stock's rally began on Dec. 10, in anticipation of the passage of the farm bill, which legalized hemp, the source of CBD, on a federal level, effectively making CBD legal and allowing interstate commerce of the nonpsychoactive pot derivative. In response to Congress' passage of the bill, New Age issued a press release, saying it was poised to aggressively expand its portfolio of CBD beverages, and that it had commitments with several major retailers pending the passage of the farm bill and the legalization of hemp, as well as commitments that give it more than 125 million points of distribution. The stock rose 28% over the three sessions from Dec. 10 to Dec. 12, and President Trump signed the farm bill into law later in the month. The other major piece of news in December was its merger with Morinda Holdings, a beverage company with a strong position in Asia that will create a combined company with annual revenue of $300 million and give New Age access to 60 countries around the world. 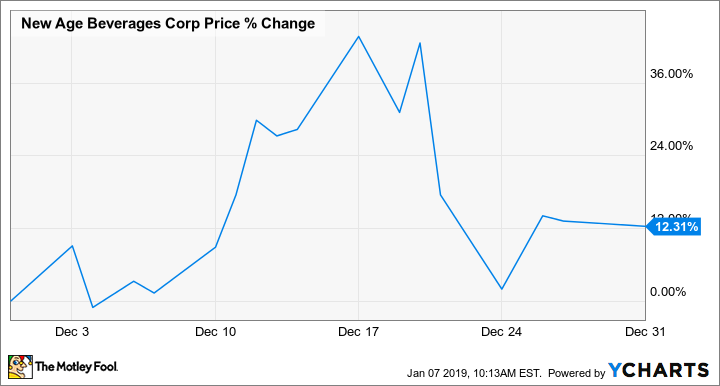 New Age announced the news on Dec. 3, sending the stock up 9%, but giving back those gains the next day as its shares have been highly volatile since it broke into the CBD market. With the farm bill now law and its merger with Morinda giving it an expanded market, 2019 is shaping up to be an exciting year for New Age Beverages. While the stock and the greater CBD industry remain high risk, there could be a lot of upside to New Age stock if CBD beverages take off. However, expect the volatility to continue.